This post has been updated on March 27, 2015 with corrected data. The data posted initially was partially wrong due to a bug in analysis code. The bug caused trips that started and ended in the exact same position to not be counted. The car2go GPS reports 5 decimal digits (resolution of about 1 m), but I have overlooked that cars at a designated parking spot always show the exact same GPS coordinates predefined by car2go. The bug then ignored trips made by cars picked up and returned to the same designated parking spot. Depending on the city, this caused about 22% to 33% of trips to be excluded and underestimated total fleet utilization by 18% to 31%. Median trip counts per car were underestimated by 20% to 32%, while median trip distances were overestimated by 22% to 31% (see below for note on round-trip distances). Trip duration median were accurate to within a minute, but quartiles were overestimated by 5% to 10%. Because the bug only affected detecting round trips, the positions maps were accurate and have not changed. car2go is a carsharing service operating in a number of Canadian cities. It has a one-way model in which cars do not have to be returned to where they were picked up, but can be dropped off almost anywhere within a specified operating area and picked up from there by another member by for the next trip. This mimics most bikeshare operations and in a sense provides a taxi you drive yourself. Systems are outfitted with a uniform fleet of two-passenger Smart Fortwo vehicles and a parking deal is negotiated, most commonly to allow parking in any resident/permit location. Data on usage of the service is available from an API, listing current positions of available vehicles. Collated over time, we can calculate a car’s trips, and some statistics about those trips. I’ve been interested in using this data to create visualizations of the service. I have created a number of animated maps (uploaded to Youtube) that track locations of available cars over time. This is something slightly different: I took in the data for a week of operations, and extracted all locations of available cars, plotting them on a single map. The result is an indication of use and demand for car2go service within each city’s operational area. Some interesting patterns emerge: correlation with residential and commercial density, impact of parking regulations and age of service. The data used is from Tuesday, January 27 to Tuesday, February 3, 2015, starting and ending at 4:00 local time. I also checked on a previous 7-day stretch, January 15 to January 22, 2015, also starting and ending 4:00 local time. Data was generally very similar, except for Toronto as noted below. A note about the methodology: This article uses data from the car2go API but is not endorsed or certified by car2go. Cars that are reserved are reported as in use by the API, so trip time includes reservation time if any. Also, I only have access to start and end locations for each trip, so distances are calculated as the crow flies. Further, a round trip in which the car2go member does not terminate the trip midway will appear to have a long duration but a short distance — about 20% to 30% of all trips in the data set analyzed were round trips with 0.0 km calculated distance. Duration of trips is remarkably similar between cities, even given differences in operating area size and usage patterns. The median duration is 23 minutes in Calgary and Montréal, 24 minutes in Toronto, and 25 minutes in Vancouver; 25-75th percentile ranges are 13-33, 13-34, 14-35, 15-34, for Calgary, Montréal, Toronto and Vancouver respectively. These wobble by one or two minutes depending on the week, but are notably stable. In all cities, trips taking taking over 2 hours are less than 5% of all trips (for Vancouver and Calgary half that), suggesting a largely separate style of use from traditional longer-trip carshare. Montréal is the Canadian city with the most recent car2go start. Service began in November 2013. The home area is the smallest of the Canadian operations and has a complex shape, generally covering east and southwest Montréal and excluding downtown, Westmount, and Outremont. Dedicated parking spots are provided downtown. Overall dimensions of the area are approximately 16 km east-to-west from east of Jardin botanique to Montréal-Ouest train station and Parc Angrignon in the west, and approximately 10 km north-to-south from Pointe-Saint-Charles to rue Jean-Talon and de la Savane metro station. The longest direct one-way trip possible is around 21 km. There are only two outlying parking areas, at Collège André-Grasset and at Chabanel train station, and none off Montréal Island. 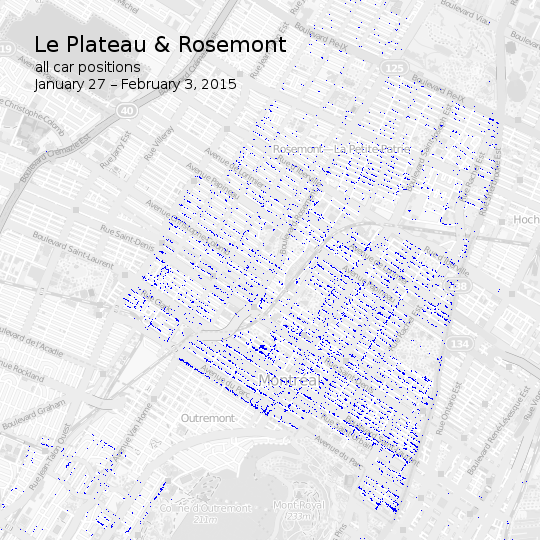 The east Montréal part of the home area, Le Plateau-Mont-Royal and Rosemont–La Petite-Patrie, is currently much more frequently used than the western parts of the area. There doesn’t appear to be a lot of longer-distance travel across the island, with only 0.19% of all Montréal trips clocking in over 10 km, the lowest figure by far within Canada (next is Calgary at 0.94%). As the youngest city where the service has not yet had as much time to develop, Montréal has fewest vehicles so far — 330, less than half of Vancouver’s. Montréal also shares with Toronto the lowest vehicle utilization ratio among Canadian car2go cities. In January, Montréal vehicles were in use about 15% of the time, working out to around 3 hours 40 minutes of use per every 24 hours. Remember that this includes nighttime stretches when most cars are not used; a private car used for a long, one-hour-each-way commute and then some errands might clock up 3 hours per day, and most are used well less than that. Over 3 hours’ use per average carshare vehicle in a system just over a year old is an excellent result. A closer look at the eastern boroughs shows heavy use in the Plateau and Mile End as well as in the free parking zone closest to downtown and the McGill campus, dropping off further east. 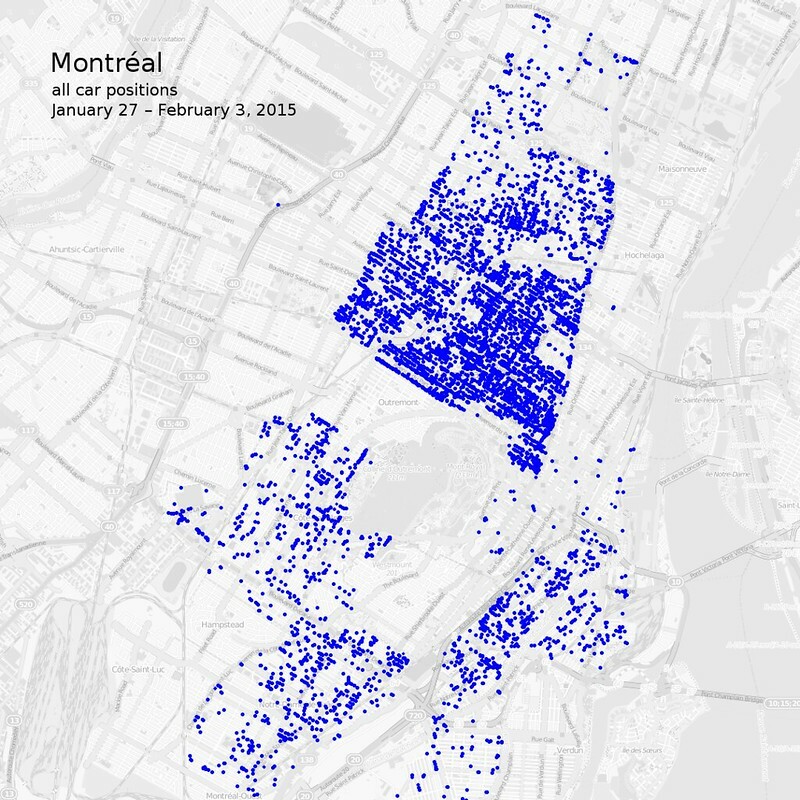 A heavy use around Avenue du Parc right on the Outremont border suggests some users live across the boundary in Outremont and park as close as possible. Service in Toronto began in June 2012. Home area stretches from the Humber River to Victoria Park Avenue, from the lake to Eglinton Avenue. This is around 8 km north-south and 16.5 km east-west. There is also a parking area at a hotel near Pearson airport. Longest trips within the home area are around 22 km, from the airport around 35 km. Toronto is the odd one out among Canadian car2go deployments in that parking just anywhere is not allowed. Instead, cars can only be picked up and dropped off at designated parking lots, including City of Toronto Green P lots. Although there is overall a good coverage, particularly closer to downtown where a car2go location is likely to not be a lot farther than the nearest transit stop, the duplication of the vehicle locations make for a less interesting map using this particular methodology. 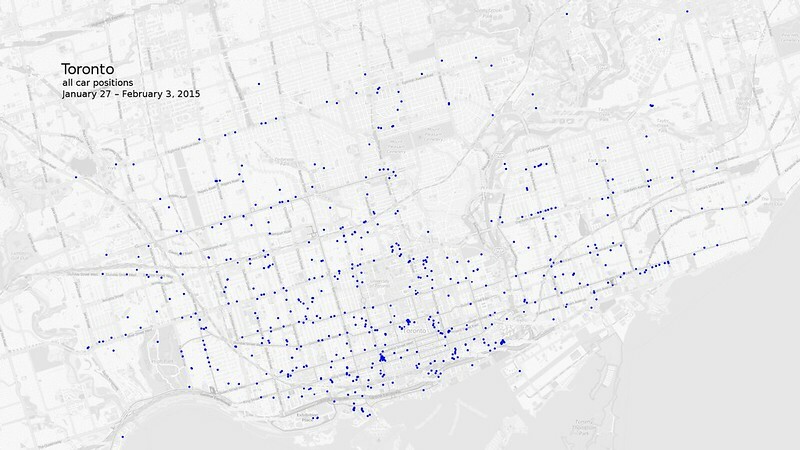 Usage clumps are visible at Distillery District, Spadina and Adelaide, Fort York, and the parking garage at Dundas and Centre, but these are just as likely to be GPS wobble or the result of a larger parking spot. Toronto has the fewest trips per car, with the median vehicle making 3.57 trips per day, or 25 trips over 7 days. However, it also has relatively long trips, as the median distance per trip is 1.99 km, bested only marginally by Vancouver with its enormous home area. 4.9% of all Toronto trips take longer than 2 hours, and 1.7% take over 5 hours, the highest proportions in Canada, though still quite low overall. Overall utilization is comparable to Montréal at about 3 hours 10 minutes to 4 hours per 24 hours depending on the week analyzed. Another thing to note about Toronto is that usage varied between two time periods I measured (January 15 to January 22 and January 27 to February 3), with the more recent usage recording 12-25% lower depending on the metric — likely due to weather differences. Service in Calgary began in July 2012. Home area is downtown and inner Calgary, stretching from Nose Hill Park to Glenmore Reservoir (around 16 km north-south) and Bowness to Calgary Zoo (around 17 km east-west), with an outlying parking area near Calgary Airport. The single longest trip possible is from airport to Lakeview, around 29 km. 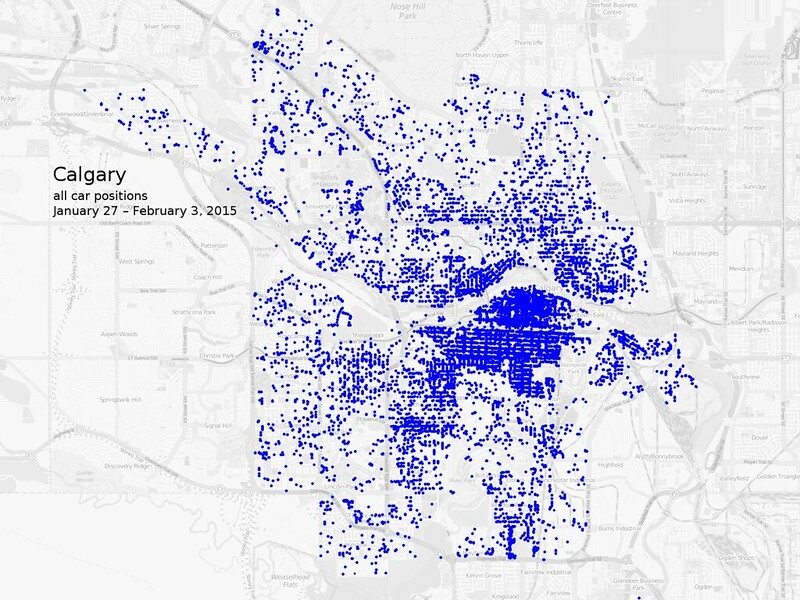 The most notable thing is the incredible concentration of car2go in the downtown area. I understand this is partially driven by Calgary’s parking regulations: parking downtown is very expensive for private vehicles, but free for car2go. This makes using a car2go a more appealing option even to people who own a personal vehicle. Usage statistics are generally stronger in Calgary than out east, though they trail Vancouver. Utilization ratio is 20.2%, meaning cars are in use on average 4 hours 50 minutes out of every 24. The median Calgary car2go vehicle makes 8.71 trips per day. The 25-75th percentile range is 7.43-10, and neither Toronto nor Montréal reach 7.43 trips in their 75th percentile range, so this is a big lead. A closer look of areas surrounding downtown again highlights the level of usage downtown and in nearby areas, as well as in Kensington and south along 4 Street SW.
Service in Vancouver began in June 2011. The home area has since expanded considerably and now includes the majority of City of Vancouver, commercial cores of North Vancouver and Richmond suburbs, and several more outlying parkspots at some of the more common destinations and higher ed schools. The home area is the biggest car2go operates in Canada. At its extremes, it stretches approximately 29 km north-south from North Vancouver to Richmond and 20 km east-west from BCIT to UBC. The longest direct one-way trip a member can make, from Horseshoe Bay ferry terminal parking spot to Langley Kwantlen campus parking spot, clocks in at 66 km. The usage is heavy in the downtown peninsula and in densely populated areas like Grandview, Mount Pleasant, and Kitsilano. The visible emptier area in middle of downtown is because there is no street parking; vehicles are concentrated in dedicated lots and parkades instead. Areas of Vancouver farther from downtown were added later, and currently aren’t as busy. Most of the newly added areas are lower-density housing, which might also influence the usage. 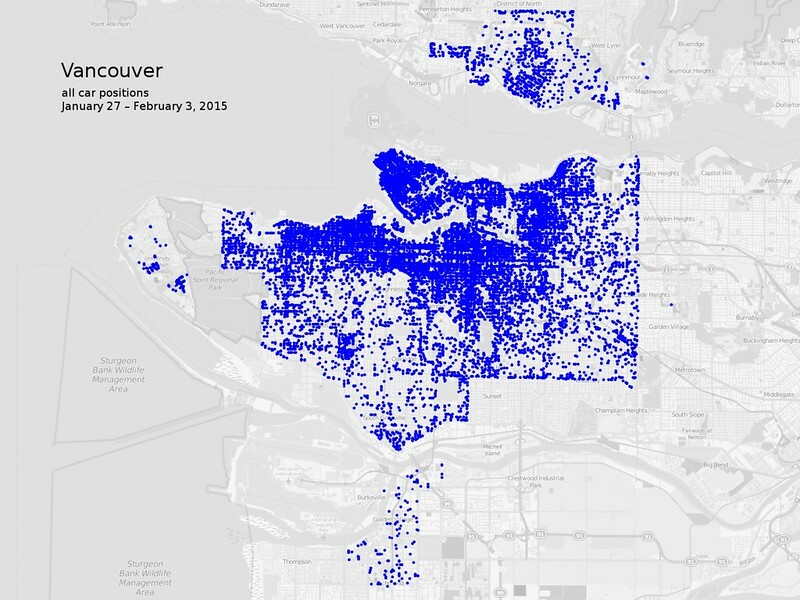 However, the pattern of higher use in denser areas holds in newer areas, with visible clusters in Kerrisdale and around Joyce–Collingwood Skytrain station, and a possible proto-cluster in Marpole. The commercial and high-rise housing core of Richmond was added as an operating area in December 2014, and is so far less used. 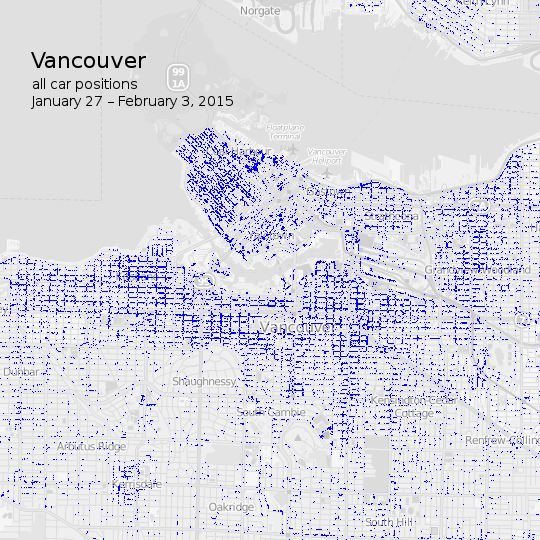 Vancouver has the most vehicles: 717 cars were in the system during the week analyzed. The cars also make the most trips, with the median car making 11 trips per day. (The busiest car made 132 trips during the 7 days, for a mean of 18.9 trips per day.) The utilization ratio is a huge 25.1%, meaning the average car is in use for just over 6 hours each day. Vancouver also has the fewest long trips. Only 1.76% of trips are longer than 2 hours, and only 0.48% of trips are over 5 hours. A closer look at usage around downtown Vancouver shows vehicles just about anywhere parking is allowed. Outside the downtown peninsula, a belt of higher use corresponds to areas of higher-density housing, from west to east: Kits Point, South Granville, Mount Pleasant, and Grandview–Woodland. On the opposite end of the scale is the upscale Shaughnessy neighbourhood, where there has been nearly no usage for the entire week.